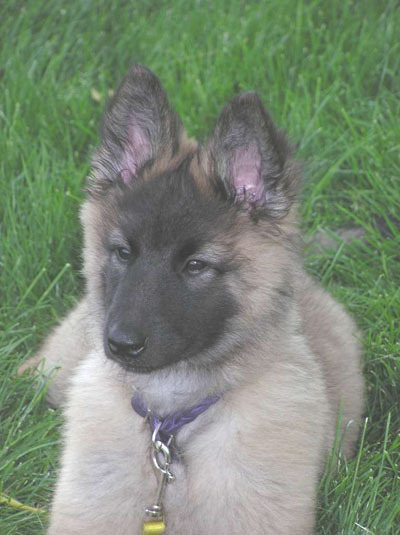 Dani, MACH2 Flashfire's Diamond Dancer MXF CD RA EAC O-EJC O-WV-E OCC O-TN-E TG-E HP-O CGC was born on April 16, 2004. She was the third of 8 puppies born to I.C., CH Snowflower Winter Rushette AX AXJ, owned by Mike and Lisa Kretner in Sacramento, California. The sire, Raider, CH Snowflower Desert Raider AX OAJ, is owned by Dave Musikoff. I was looking for another performance dog like Katie, and I.C. was that kind of dog. 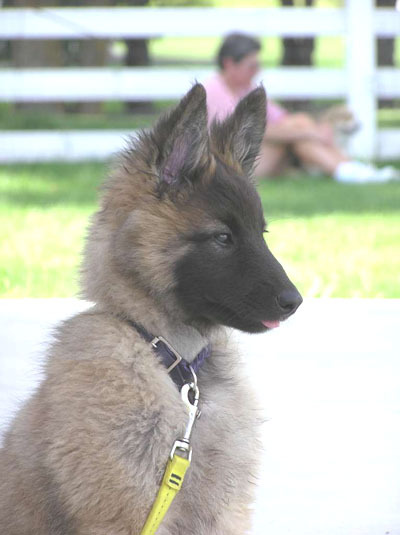 Dani was a leader in her pack as a pup. She was one ofthe first to try everything and she especially loved the baby teeter Lisa and Mike had for them. She would bang it back and forth for the sport of it. She had a very strong bond with Lisa and Mike but didn’t care so much for the visitors that came around. But when I drove down to pick her up, she came to me and greeted me. She trotted off but then came right back and sat down next to me, and stayed. Lisa was most impressed as she never acted that way with others. And so it was that Dani was about to enhance my enjoyment of dogs and my knowledge of dog training. All dogs have special gifts and special issues. Dani loves doing anything with me. 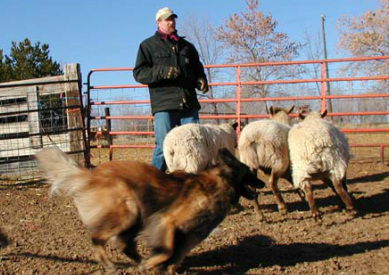 She loves tracking, obedience, freestyle, herding, and of course agility. I had been spoiled by Katie who aggressed the course as long as I pointed the way. But Dani thought it was more of a team sport. So I have learned how much fun it is to aggress the course together with her. Dani started her agility career just one month short of 2 years in March 2006. 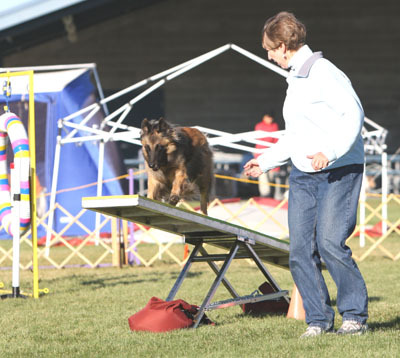 By September, she completed her AKC Excellent Agility title and was beginning to earn MACH points. 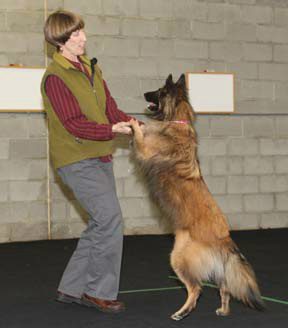 She completed her Excellent Agility Jumpers title in March 2007 and has begun earningDouble Q’s. 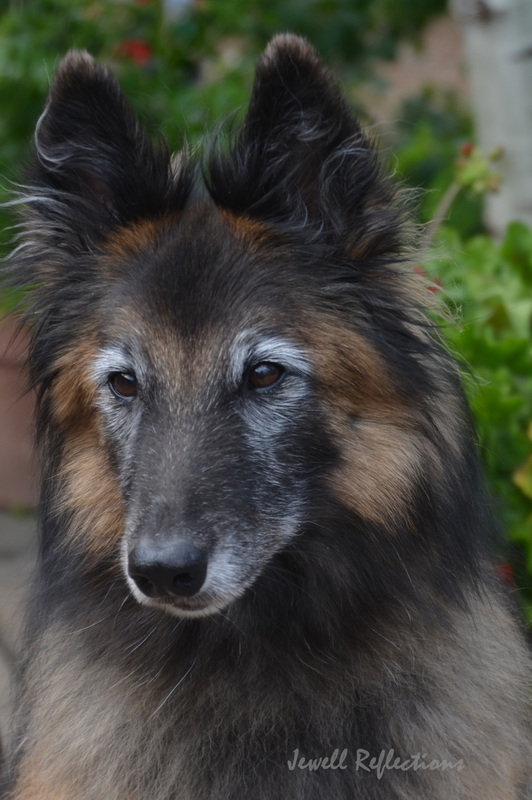 She also earned her Canine Good Citizen Certificate in September 2007. 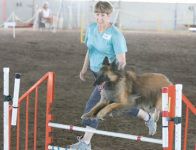 By May 2008, Dani completed her Masters Agility and Masters Agility Jumpers titles. By December 2008, Dani had accumulated 894 MACH points and 6 Double Q's toward her MACH title. She was also ranked #12 Belgian Tervuren in AKC agility in 2008. In 2009, Dani qualified for AKC Nationals. My goal for 2009 was to complete her MACH title but it didn't happen because my real job was taking up so much of my energy. She did get to try her hand at herding which she loved (but the sheep didn't enjoy her charging style). Dani also helps me teach my reactive dog/focus class although Rosie is the best helper dog I have. 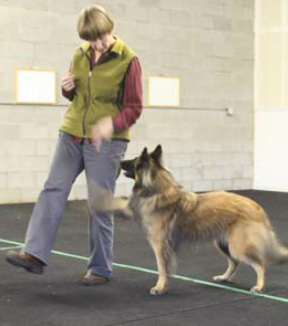 Dani has also had the opportunity to earn her Rally-O Novice title at the Idaho Capital City Kennel Club Dog Show in Oct, 2009. It was fun so we will be working on the advanced rally titles. 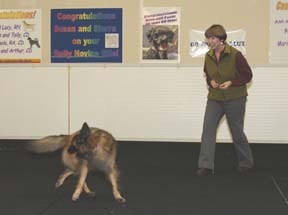 One of the highlights of 2009 was presenting to teachers about how positive reinforcement and other techniques used to help reactive dogs deal with their environments could also be helpful with troubled children. Dani and I helped Dr Meredith St Clair with these presentations. 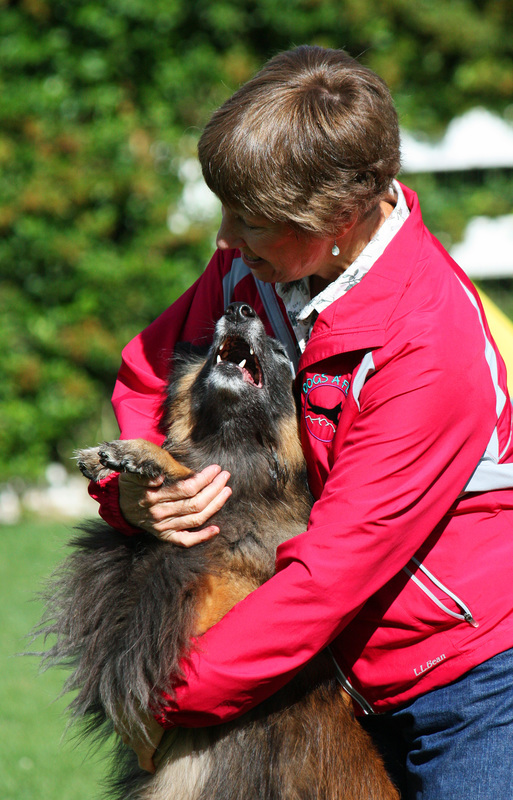 Dani also was able to do a canine freestyle routine to Pretty Woman as part of this effort. 2010 brought us the elusive MACH title on July 25 on our home turf in Boise! The courses were challenging and Dani was the only qualifier in her jump height on the jumpers course thanks to a great tunnel call-off and a smooth run. Our standard run was smooth as well. It was our day. Dani has earned almost 1800 speed points while earning those 20 double Q's. Dani and I worked on her obedience skills and we competed at the Treasure Valley Dog Shows in October 2010 in Rally Advanced and Novice Obedience. Dani earned both titles with a 3rd and 4th in the Novice B Obedience ring, and three 2nds in Rally Advanced. On to the next level! Dani earned her MACH (Master Agility Championship) on July 25, 2010 in Boise at the Idaho Capital City Kennel Club Agility Trial! What a fun day! On May 28, 2012, Dani earned her final Double Q for the MACH2. See her last run at http://www.youtube.com/user/dogsaflying?feature=results_main . On May 11, 2013, Dani earned her Rally Excellent title. She earned a first place on her second time in the ring. I felt like we were a perfect team. Here's our performance at https://www.youtube.com/watch?v=Qgy_SSz0Rpw . In December 2013, here's a video of Dani and practicing for a freestyle presentation - http://youtu.be/ONu9iuBhpWg . My beloved Dani went to the Rainbow Bridge on Fri, Oct 14, 2016 joining Katie, Rosie, Heidi, and Sparky. She was a powerful force as all that knew her would agree so she leaves a big hole in our lives. 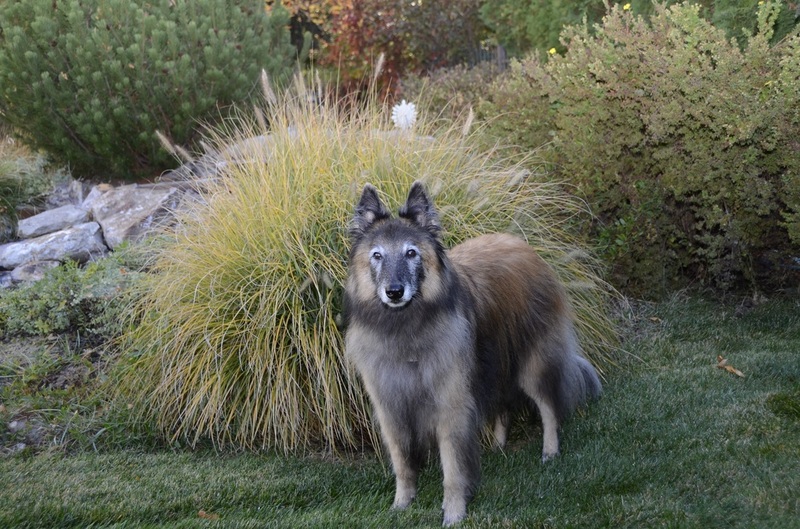 Dani was 12 1/2 and had hemangiosarcoma, an aggressive cancer. I was able to let her go before she suffered a rupture event. Dani was an awesome agility partner for many years and ran with gusto even at AKC Nationals. But in addition to that, she was a great partner for our assisted living visits with the Dancing Dogs of Boise. She was poetic in how she moved lightly around the dance area. And afterwards, she was eager to share herself with the residents. She also lived a full life including chasing sheep with reckless abandon, learning canine nosework and passing her odor recognition tests, earning a Rally Excellent title, earning her Companion Dog title, and earning a Canine Good Citizen Certificate although that took two tries, and was my able demo dog for so many classes I taught starting when she was 6 months old. The last class she assisted in was a freestyle class two weeks before leaving us. She came to me from Lisa and Mike Kretner and was known as one of the pistols of the pack. She lived up to that early reputation and was such a significant force in my life. Thank you Dani for all you gave to me and to so many others. Photos by Randy Gaines and Fran Jewell. Here's a bit of freestyle to our favorite song, Pretty Woman. And now on to herding where we are just learning the ropes with the assistance of Kelly Orr. 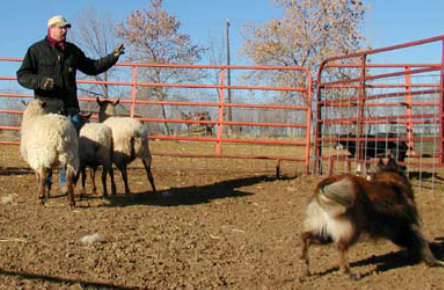 Dani has lots of drive for herding and she finds it very exciting, maybe a little too exciting. I think the sheep will like it when she calms down a bit. 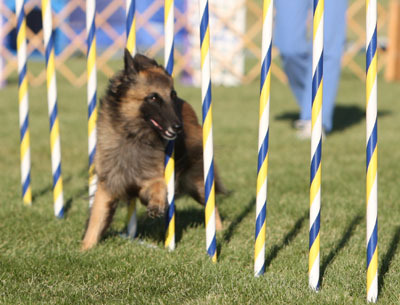 Here's a great picture of Dani competing at our trial. She placed on every run but then I pulled her due to soreness. She is 8 1/2 years old now. She is a terrific agility partner! Thanks Randy Gaines for the great picture! ​The below photos taken by Nancy Christensen, Fran Jewell, and Lee Prince.